It is estimated that 1 in every 25 children will have a febrile seizure, according to the National Institutes of Health. For parents whose child experiences a febrile seizure, the experience can be terrifying. 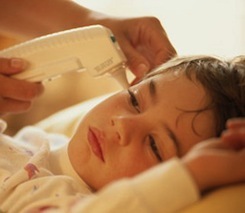 Many parents are surprised to learn that young children can experience a seizure as a result of a fever. Fortunately, while febrile seizures are horrifying to watch, they are typically harmless and result in no long-term health risks or complications. Parents and caregivers should be familiar with these 10 facts about febrile seizures, so that they are prepared should a child in their care experience one. A febrile seizure can occur when an infant or young child’s temperature rises too quickly. Fevers can be a result of an infection or associated with routine immunizations, and can occur in otherwise healthy children. Most children who have febrile seizures have a rectal temperature of at least 102 degrees Fahrenheit. Rectal temperatures can provide the most accurate temperature reading in infants and young children. Age is an important risk factor in febrile seizures. Febrile seizures typically occur in children between the ages of 6 months to 5 years. Toddlers are at the highest risk for having a febrile seizure. Febrile seizures are convulsions of the body. In simple febrile seizures a child’s eyes may roll and his limbs may stiffen. A child may also lose consciousness and experience convulsions in both limbs on both sides of his body. The seizure typically lasts between a few seconds and 15 minutes. In complex febrile seizures children may have convulsions in only one part of their body. These seizures typically last longer than 15 minutes. Febrile seizures are not a precursor to epilepsy. Between 95 to 98% of children who have a febrile seizure do not develop epilepsy, according to the National Institutes of Health. The biggest risks to a child having a febrile seizure include injury from falling or choking on food or saliva. Children having a febrile seizure should be placed on the floor or ground and turned on their side. Nothing should be placed in the child’s mouth. If food or objects are present, they should be gently removed. Children having a febrile seizure should be closely observed. The location of the convulsions and the length of the seizure should be noted. The child should not be restrained. Once a child’s seizure has ended he should be taken in for medical treatment. Your child’s doctor may wish to determine what is causing the fever. For example, he may want to rule out an ear infection or meningitis, if other symptoms are present. According to the National Institutes of Health, there is no evidence that febrile seizures cause death, brain damage, epilepsy, learning issues, or a decrease in IQ. Parents and caregivers of children who have had a febrile seizure should take steps to familiarize themselves with a treatment plan should the child experience one again. These steps may include consulting with the child’s doctor about when to start fever reducing medication when a child develops a fever, receiving a prescription of diazepam (valium) to administer rectally if a seizure occurs, and brushing up on CPR and first aid should the child stop breathing as a result of the seizure.